Alberta’s government has undertaken to reform the existing health legislation and create a new Alberta Health Act. The initiative is summarized in “A Foundation for Alberta’s Health System” (subsequently referred to as the Foundation). The rhetoric in the Foundation document heavily emphasizes individual responsibility and flexibility of delivery systems. It replicates rhetoric seen in Ralph Klein’s Third Way and the 2002 Mazankowski report. In this report we identify the potential risks associated with such an act. The report is based on reviews of materials available on the new health act initiative with input from a national working group and a research symposium. The government’s main focus with this initiative is to “reorganize and revamp the delivery system.” The Alberta Health Services states it as, “Recognize role of private and non-governmental organizations in service delivery within the Canada Health framework.” The submission by the Calgary Chamber of Commerce takes it one step further, stating that “Surgical facility operators have commented that the system would function at much higher level of efficiency if AHS were stripped of its regulatory function.” It also states that the Chamber has long advocated the repeal of the Health Care Protection Act. i. Quality and safety of health services. ii. Costs of health services. Findings include higher death rates in private hos¬pitals and dialysis clinics, more quality deficiencies and less nursing care in nursing homes and less care to the dying in hospices. Investor-owned hospitals spend much less on nursing care than not-for-profit hospitals, and their administrative costs are 6% higher. Privatization takes money from the pockets of under-paid, mostly female health workers and gives it to investors and highly paid managers. 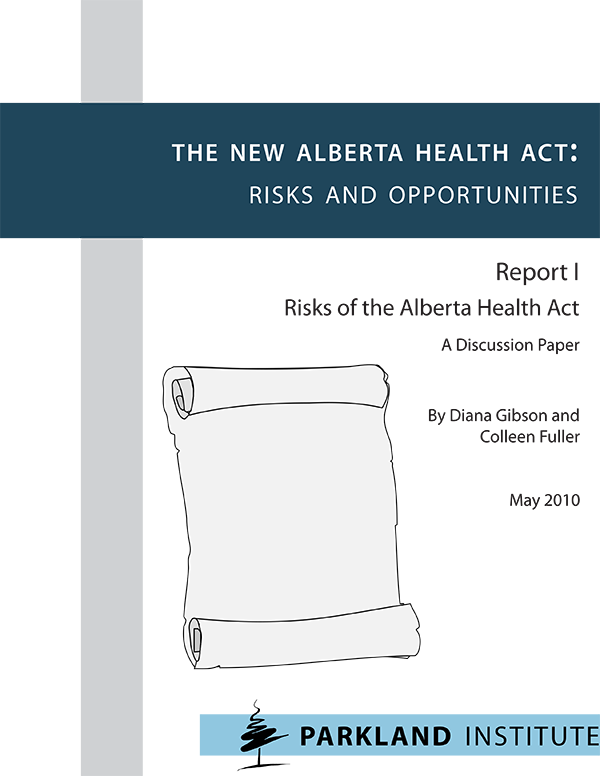 One of the key priorities identified for the new Al¬berta Health Act is to make definitions standard across health care legislation in Alberta by merging a number of the acts and standardizing definitions. This includes the Nursing Homes Act and the Hospitals Act. Protec¬tions in the Nursing Home Act include ratios for nursing staff, as well as a variety of other regulations protect¬ing quality or care. Standardization may lead to the lowest common denominator. It also may be used to get rid of wording that limits for-profit involvement, protects the public sector, or dictates higher quality standards such as nursing ratios. The repeated commitments that the new Alberta Health Care Act will comply with the Canada Health Act are hardly reassuring. Alberta’s legislation already exceeds the CHA in important areas. These include limits on the evolution of a parallel private system through bans on doctors working in both systems. There is no indication that these protections will not be lost. A number of other jurisdictions have experimented with the patient bill of rights. These are very controversial. The online survey being conducted by the Advisory Committee contains a number of elements in the patient charter that raise concerns. i. Rights to timeliness and access -There is debate as to whether or not time guarantees should be included in a patient’s charter. Some legal and policy experts argue it could be used to improve accountability and outcomes on wait times. Others suggest that it could be used as a vehicle for opening the door to more privatization in a Chaoulli-style lawsuit. The risk of this would depend very much on how those rights were articulated. For example, Quebec’s charter includes timeliness and access provisions, but those are limited specifically to the public system and by caveats related to the limits imposed on the public system. ii. Responsibilities - The act as proposed places strong emphasis on personal responsibility. The online survey includes a section on patient responsibilities such as: learn how to better access health services; use services appropriately and wisely; and make healthy choices. This shifts responsibility from health care providers and the government to individuals, and is a significant move away from universality. Emphasizing patient responsibility for health can lead to system biases against people with unhealthy habits such as smoking, poor diet or lack of exercise. Personal responsibility is important, but these issues should be dealt with through public education and intervention programs and policy initiatives. Considerable resources are required to create a new Alberta Health Act and important risks are associated with that scale of legislative change. This report finds that there is nothing to be gained with the new legislation as proposed to date that could not be done under the current legislation and much that could be lost. The initiative should not proceed as proposed. The legislation should only be changed if the real objective is to strengthen the public health system and better integrate the community sector within it, and to put a limit on any further for-profit delivery. This is the topic of the forthcoming second report in this series.